When you think about your dream summer holiday, it’s impossible not to add Greece to your bucket list. Known for its ancient ruins, sunny beaches, delicious food and friendly locals, the country has a lot to offer for any kind of backpacker. It’s also great for travellers on a budget, when compared to other Mediterranean destinations. Whether you are looking for a hostel by the beach to sunbath on or a chill place to meet other open-minded travellers, we’ve got you! Here is our list, with the best hostels in Greece – from party hostels to hostels perfect for couples and much more. Greece is a great place to explore, full of ancient history and legends, stunning nature and backpackers from all around the world. If you are travelling solo, we are sure you will find the perfect travel buddy in one of our sociable hostels. There will be plenty of opportunities for you to get to know other like-minded travellers: join a pub quiz, walking tour, karaoke night or just chill in the common area of the hostel. Athens backpackers is a true gem in the heart of Athens, just between the Temple of Olympian Zeus and the Acropolis. It’s a perfect place for solo travellers to meet other backpackers, with plenty of opportunities to socialise, such as quiz and karaoke nights and daily walking tours. They also have a rooftop bar with great happy hour deals (and free shots!). Enjoy your drink while watching the sunset and the best view of the Acropolis, then wake up the next morning to a delicious free breakfast! Caveland is a super chill hostel nested in a 18th century winery in the heart of Santorini island. You are going to stay in a beautiful traditional Greek cave and enjoy a stunning sea view from the terrace. The guests love the swimming pool, free breakfast and the super helpful staff. Amazing beaches, hostels in traditional caves, delicious food and an incredible culture. Greece is the perfect romantic holiday destination. We are talking about hostels with rooftop bars, locations in the heart of the city, free breakfast, beautiful gardens, and many other features for you to enjoy a romantic getaway. If you are travelling with your loved one, but are still looking for hostel’s social vibes, BedBox will be perfect for your stay. The hostel is in the heart of Athens, close to all the main attractions and has a terrace, a lounge and a kitchen for you to cook your romantic budget meal. They also have a hostel bar, so you don’t have to worry about looking for the perfect place for a drink. We are sure you will leave BedBox full of new travel buddies and amazing stories to tell. Imagine having a romantic getaway in the centre of the old city of Thessaloniki and coming back to a very chill hostel with a beautiful garden, free breakfast and incredibly friendly and helpful staff. Does it sound like your perfect romantic hostel dream? We thought so! All rooms have a beautiful view, perfect for having your breakfast overlooking the Old City. If you are looking for the true hostel experience, the hostel is known for being really social and for hosting incredible backpackers from all over the world full of stories to share. Looking for the best party experience in Greece? These hostels are so perfect for party lovers, that you won’t even have to go into town to have a wild night. Dj’s live sets, bars at the beach, great happy hour deals, a hostel nightclub AND a booze cruise, will guarantee (un)forgettable memories (depending on your blood alcohol ratio). Paraga Beach Hostel has everything a party animal could ask for: a swimming pool just above sea level, a hostel bar, DJ’s live sets, a beautiful beach just a few steps away and people from all around the world. Spend your days relaxing on a sun bed in front of crystalline water and enjoy some amazing food in the hostel restaurant at night (they even have a wood oven pizzeria!). If you are on a budget, don’t worry, they also have a mini market with everything you might need, AND they pick you from the airport or ferry for free. You can choose between a bungalow, a tent, a private room or a dorm, all options are guaranteed some serious stargazing. We also HAVE TO mention the hostel’s boutique, where you can buy all sorts of fancy things if you feel like treating yourself. Far Out Beach Club is a backpacker’s paradise, especially if you like to party. They offer two different areas that you can choose from depending on your mood. If you feel like enjoying some music, meeting new people and bar hoping, go to the Far Out Camping. If you need some serious chill time with cocktails after partying too much, head to The Far Out Village Pool Bar & Restaurant. Wake up every morning with the peaceful Mylopotas Beach just in front of the hostel and spend the day enjoying one of the many activities offered by the hostel – BBQ and pizzeria, tennis court, pool table, live music and outdoor cinema. The Pink Palace is the dream for backpackers who love adventure travel, parties and a 24/7 hostel. Enjoy four different bars. Yes, you read it right. FOUR bars at the same hostel: rooftop bar, cocktail bar, beach bar and night club. All of them have amazing happy hour deals and their own vibe, so you can choose if you prefer to chill on the beach or to party until the sunrise. If you are a thrill-seeker, join the Kayay Safari to explore secluded nearby beaches, visit a desert island, do some cliff diving and snorkelling. If you want to get the party going, join the Booze Cruise, a day touring on the west coast of the Island, beach hopping and getting to know other guests. Daily activities include pub quizzes, toga parties, city and island tours, water sports and of course beer pong. Like all this is not enough, you can also enjoy a private beach with your new travel buddies! Do you want all the fun social vibes of a hostel, together with a room to call your own and relax in after a day’s exploring? We’ve got you! Greece has great hostels with private rooms for you to enjoy the best of both worlds. If spending the day visiting ancient sites in Athens and coming back to a beautiful vintage hostel sounds like your deal, then Athens Quinta is perfect for you. The recently restored neoclassical manor is guaranteed to give you some royal feelings and some serious chill moments in the hostel garden. If privacy is what you need, Athens Quinta offers amazing deluxe double bed privates and common areas, for when you feel it’s time to get to know other backpackers! Artemoulas is the perfect place to stay if you are looking for privacy during your visit to Mykonos. The hostel offers studios with private balconies opening out on to the garden and a swimming pool, perfect for some chill time before heading out to explore town! If you want to treat yourself (even more), they also provide a complimentary transfer from/to the airport. Still didn’t find the perfect hostel for your trip? We have more amazing hostels in Greece that will convince you to book your adventure right now! This brand-new hostel’s goal is to offer the best experience for backpackers visiting Mykonos for a fair price. The town entrance is just a few steps away, where you will find amazing cafés, bars and restaurants. The hostel has a swimming pool with a bar, where you can chat with other travellers and make plans to explore town later. If having free breakfast on a rooftop with a stunning view of the Acropolis sounds like the perfect hostel experience, City Circus Athens is the place for you. You will be in Psirri, an arty and bohemian neighbourhood full of bars, restaurants, street art and other amazing things to explore. If you want to visit the Athens’s main attractions, no worries, The Acropolis is just 20 minutes’walk from the hostel! Don’t forget to indulge yourself in some delicious traditional Greek cuisine in the hostel’s new restaurant Zampano, inspired by Fellini’s masterpiece “La Strada”. Have you stayed in an amazing hostel in Greece that is not on the list? Comment below and help other travellers to explore the world! 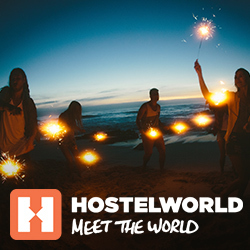 The post Best hostels in Greece appeared first on Hostelworld Blog.